damage the esteem of others – and our relationships. 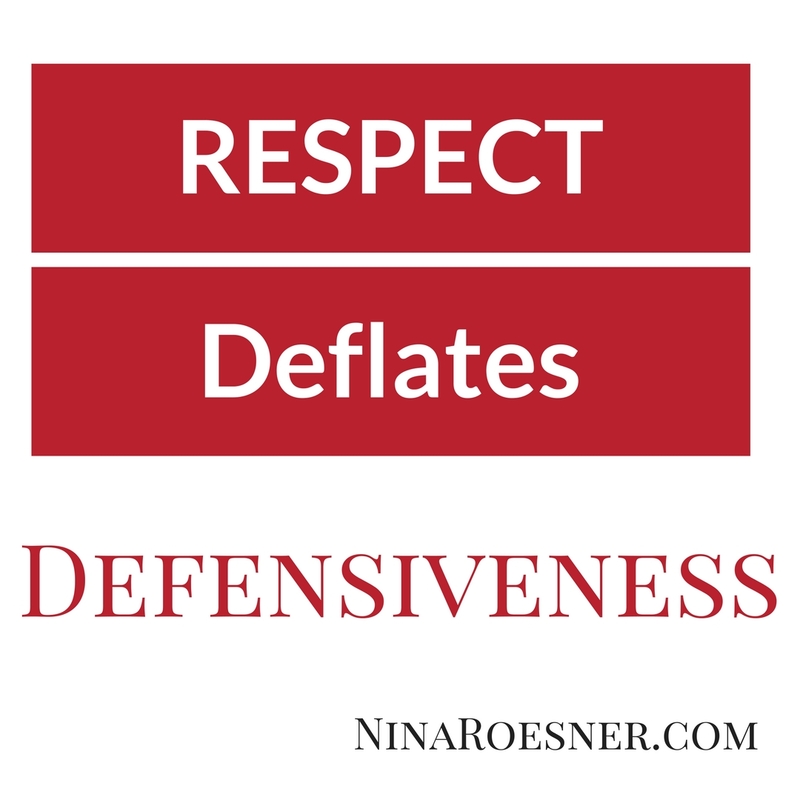 Today we’re talking with causing defensiveness. Be sure to stick with me til the end – I will share a link to the Debbie Chavez show – we deal with teens & defensiveness. Kim watched the traffic inch forward. The ice cream is melting and I have it in a paper bag – hope it’s sitting upright, she thought to herself as she slowly made her way to the turn for the bank. Her husband, Paul, had asked her to stop by on her way home from work and deposit some checks and grab cash for the weekend. She’d combined the trip with her grocery run, and dropping off forms at the school. The boys, their four-year-old twins, had been a handful and the dog had thrown up in their bedroom. She’d spent half the morning cleaning up the mess, trying to save the carpet. Then it was nap time for the boys and finally, she was able to run her errands for the day. NO…they’re closed! She could see from the road that the signs were off over the drive through. Glancing at the time, she saw traffic had made her later than she had hoped. She’d have to go inside to use the entryway ATM. But the ice cream…and the frozen juice, and the heat… She worried about the 100 degree heat and how fast the car would heat up if she parked and went inside to make the transactions. She looked at the traffic – it would take her a while to get back onto the road in this mess. It would probably only take 5-10 minutes – maybe, if she could get back on the road easily…but the frozen stuff is probably already soft from the extra time in traffic. I better just go home and can run down here tomorrow morning. Fifteen minutes later, she walked in carrying the groceries. She checked the ice cream – the center was still frozen, the sides melted. She was glad it didn’t spill, soak through the bag, and stain the seats. The frozen juice seemed to be in a similar condition. She put them both in the freezer. “Yes, I did, although the chocolate ice cream almost became chocolate soup. I sat in traffic for nearly 40 minutes just trying to get back from running forms to the school before the office closed. There must have been an accident on the freeway,” she replied. “You went to the bank, right?” He asked. Kim frowned. He didn’t even acknowledge that she’d had a rough drive, too. This is just like him. Yesterday he didn’t even notice how hard I worked on dinner. He never notices anything I do. Last year when I painted the bathroom, it took him a week to notice and he didn’t even thank me. “Well. I was going to, but I had already spent a bunch of time in traffic, and the ice cream was melting, and I didn’t think I’d be able to get back on the road easily from the bank turnout – you know that’s a tough place to get out of even when traffic isn’t bad. I’ll run down there in the morning, though,” she said. Seriously? She’s home all day and I ask her to do one thing and it’s like the last thing on her mind. What’s a guy got to do to have a simple request paid attention to around here? “Tomorrow is too late. The house payment comes out of the account today – and now there’s not money to cover it. Why couldn’t you do just the one simple thing I asked you to do?” he asked, frustrated. I can’t believe he’s saying this to me. He is so blind! He has no idea how hard I work or what I do all day while he gets to hang out with grown ups and use his brain and I’m stuck here cleaning up dog vomit and trying to keep the twins from dismantling the house. He doesn’t appreciate anything I do at all. Typical. There she goes again. I can’t talk to her. She has no idea what’s going on with us financially and I can’t even get her to listen. I’m stupid to think she’d do anything for me anyway. I don’t even know what to say at this point. Whatever. It always goes like this. What was I even thinking, asking her to do something? Paul stared at his wife. She looked back at him. He turned and left the room. An hour later, dinner together as a family was executed in silence, save the chatter of the two boys, but even they seemed subdued, aware of the tension in the room. I’m so sorry if it is. Kim frowned. I feel bad – he looks concerned. And disappointed. My bad. She would have figured out how to make that happen if I would have let her know more. “I’m sorry – is there anything I can do now?” she asks. “Hey, so I should have told you it was about the house payment. I’m sorry I didn’t do that. I’ll run down to the ATM after dinner, K? No worries,” He continued, smiling. How does RESPECT play into this? Respectful behavior deflates defensiveness – in this case, by ascribing truthful or positive motives to the other person. We have respect for ourselves when we choose to allow thoughts that are true, noble, right, pure, lovely, admirable, excellent or praiseworthy to run our brain. I’m not suggesting that we become like “Polly Anna” and ignore truth – what I’m suggesting is this: we don’t actually know what is true about another person – especially if they are the opposite gender. I’ve written a ton about the differences in the brains of men and women and how physiologically, our differences work in opposition to connecting with each other – but BUT we CAN over-ride that by controlling what we think about. We have to recognize the power of our thoughts. Tons of research has been done on the “self-fulfilling prophecy” – we create the outcome we don’t want – or do want – based on our thoughts about it. As leaders, the research shows people will tend to live up or down to our positive or negative thoughts about them. Ascribing negative motives damages not only our relationships, but actually can create the negative outcome we want to avoid. Wisdom refuses to entertain negative or prescriptive thoughts about another person. The research shows this actually impacts our level of happiness, and for centuries, wise people have been encouraging us to “give the benefit of the doubt.” To remember “there’s something we don’t know,” and to “think the best not the worst” of someone is extremely helpful to relationships – it changes how we interact, and effects our level of happiness. Todd Kashdan and Robert Biwas-Deiner’s 2013 Psychology Today article covers the details. So much of our interactions with other people takes place in our own head. The thoughts we choose to breathe life into by giving voice to them – either in our head or via our mouth – makes a huge difference in the outcomes of our conflicts. But what if you control your thoughts – and the other person doesn’t? What do you do then? We’ll talk more about this next time! Bottom line: What happens in our mind determines what comes out of our mouths. Get your thoughts under control & this will change your relationships. In looking at the first and second exchanges, what opportunities do you have within your thoughts to better deal with conflicts? Maybe there is one you struggle with more than others. Which is it and why do you think that is? Did your parents have exchanges like these when you were growing up? How did those impact you? How did they impact your thinking about yourself? How did they impact your thinking about others? What is the number one thing you recognize today that you need to do differently to be more effective in your relationships when it comes to conflict? Are you signed up? We’re on the Respect 101 Journey – sign up in the sidebar and get these delivered to your inbox so you don’t miss a single one!  If you are already signed up for the marriage tips, you’ll get them already, so no need to sign up again. If you are a parent of kids 8 and up, you’ll want to check out my co-author, Debbie Hitchock’s, blog – it deals with how these thoughts impact your relationships with your kids. Can’t wait to dialogue with you in the comments! Share your thoughts below! . . .I think it is to take personal responsibility and be accountable and open (re: own that you failed to explain that the house payment comes out of the account and that is why it was critical to get the deposit made today.) Wake up! Pay Attention! Love! Pray! . . .Most people, if they are like me, can not deal with the speed at which that interaction is going to take place, so really try to slow it down. If I even think an interaction is going to be contentious or starts becoming that way, I say: “Can we pray just a minute?” . . . Yeah, we are praying a lot but that is not bad. . . . Also, realize that we are all here together very, very briefly on this earth, so let us accept reality fully, take personal responsibility seriously and take care of one another by being kind, generous and gentle while we can. We all know in James it says: “For what is your life? It is even a vapor that appears for a little time and then vanishes away.” Never let yourself linger in the lowlands of relationship complacency and partial fulfillment, keep thinking and trying different things. . . . . And Nina, there are so, so many great ideas in this article! . . . I cannot believe all the time you and your team put into these wonderful posts but thank you so much. I really appreciate them.